An audio-visual journey through a Jewish family’s memories of their lost Iraqi homeland. Following the performance on the 21st, there will be a concert by the new band 3yin, a ground-breaking London band who perform the music of the Jewish communities of the Middle East and North Africa. 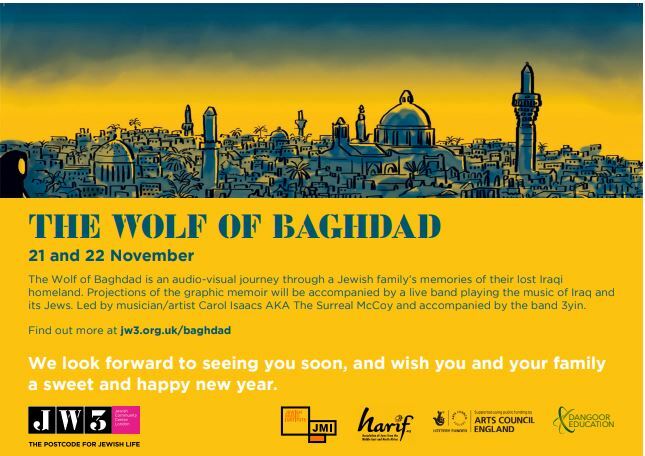 Following the performance on the 22nd, the artists and musicians involved in the Wolf of Baghdad and the band 3yin will be speaking after the performance, about the artistic inspirations that have compelled them to create innovative new work based on their personal histories and heritage.